(with attendant), or anything else that I can go pick up, bring home, realize that it's crap, and throw away myself a week or so later. 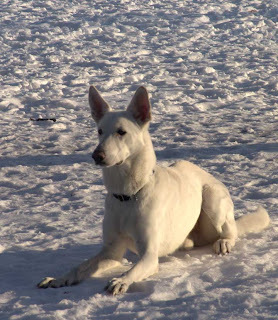 Checking over the "artist" section, I read a post from someone looking to have photos taken of their white German Shepherd, in return for copies of said photos. I immediately thought of how amazing a painting of this beautiful creature amongst all this snow in Toronto would be. Our good friend Carol has been a long time supporter of ours, and with her striking features I knew she would be perfect for the painting. After scoping out a few locations, Kelly and I found a white picnic area building right on the beach in "the Beaches" area of the city. So with Minus 20 weather, we all braved the wind whipping off of Lake Ontario and got down to it. It was freeezing, but Carol was a real trooper and I took some great shots. Thanks again to Stephanie for the use of our good pal "Linux" the dog, and to our friend Ebony who came through with Carol's wardrobe right off of her own back.